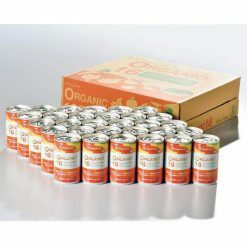 A healthy juice using 16 kinds of organic vegetables and fruit, produced in our certified organic JAS factory. Great tasting vegetable juice with added bananas and apples has a natural sweetness. The can contains a sanitary 160 g serving size. Vegetable and fruit mix juice with 16 kinds of organic raw ingredients. 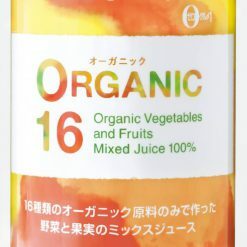 ORGANIC16 is a convenient, safe, sanitary way to add more vegetable and fruits to your daily diet. 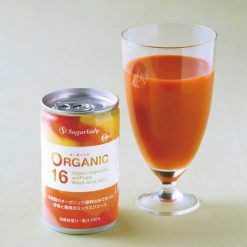 ORGANIC16 was made only using fresh, organic raw vegetables and fruits with no added sugar or salt. It provides a wide variety of nutrition boost including Vitamin A, Vitamin B1/B2, Vitamin C, Vitamin E, magnesium, folic acid, potassium, lycopene, carotene, zinc, iron, fiber, and more. Easy to drink especially for those who are not the veggie fan, since there is no grassy smell. Other juices that can be stored at room temperature go through a heat sterilization in the production process. In order to compensate for the taste, flavor, color and nutrient that are lost from heating, they often supplement it with food additives other than vegetables and fruits. On the contrary, ORGANIC16 only uses its ingredients itself to adjust the lost elements. Do not freeze, as the content might inflate and damage the container. It is better served chilled. Shake well before serving. The materials from the vegetables and fruits may settle at the bottom, but it does not affect the quality. Please drink immediately after opening the can. Please be careful as the contents may spill when opening the can. Please take caution so you won’t hurt the nails at the time of opening the can. There may be a slight variations in color due to raw materials. This product contains (Vegetables) organic carrot (New Zealand, the United States, etc. ), organic tomato (the United States, etc. ), organic pumpkin (domestic), organic radish (roots, leaves / domestic), organic komatsuna (domestic), organic water convolvulu (domestic), organic Malabar spinach ( domestic), organic molokheiya (domestic), organic cabbage (domestic), organic ginger (domestic), organic onion (domestic), organic perilla (domestic) (fruit) organic banana (Brazil, etc. ), organic apple (Argentine, etc. ), organic lemon (Spain, etc. ), organic sudachi (domestic). This product is not suitable for anyone with allergies to apple or banana.